Definition at line 26 of file CQLayoutsDM.h. 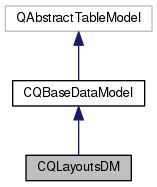 Definition at line 16 of file CQLayoutsDM.cpp. Definition at line 21 of file CQLayoutsDM.cpp. Definition at line 31 of file CQLayoutsDM.cpp. Definition at line 36 of file CQLayoutsDM.cpp. Definition at line 64 of file CQLayoutsDM.cpp. References COL_NAME, COL_ROW_NUMBER, COL_SHOW, FROM_UTF8, mpListOfLayouts, and rowCount(). Definition at line 41 of file CQLayoutsDM.cpp. References COL_NAME, COL_ROW_NUMBER, and COL_SHOW. Definition at line 93 of file CQLayoutsDM.cpp. Definition at line 163 of file CQLayoutsDM.cpp. References ListViews::ADD, ListViews::LAYOUT, mpListOfLayouts, CQBaseDataModel::notifyGUI(), and CCopasiVector< T >::size(). Definition at line 158 of file CQLayoutsDM.cpp. Definition at line 216 of file CQLayoutsDM.cpp. References C_INVALID_INDEX, CQMessageBox::confirmDelete(), FROM_UTF8, CCopasiVector< T >::getIndex(), CCopasiObject::getObjectName(), mpListOfLayouts, and CQBaseDataModel::removeRow(). Referenced by clear(), and CQLayoutsWidget::deleteSelectedLayouts(). 223 // before actually deleting any item. Definition at line 181 of file CQLayoutsDM.cpp. 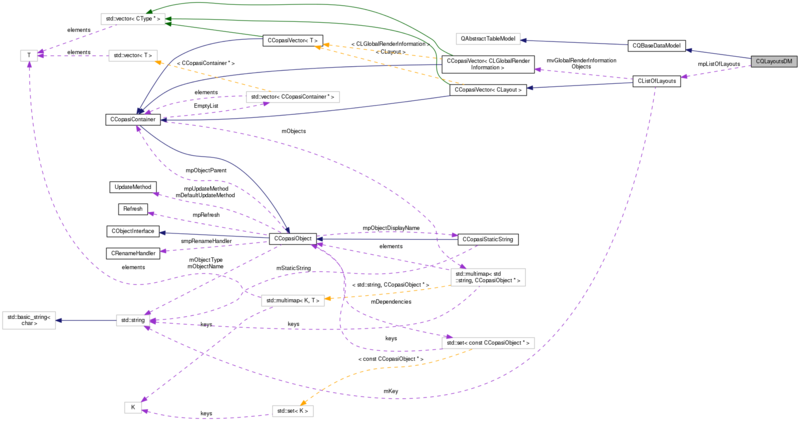 References CCopasiVector< T >::begin(), ListViews::DELETE, ListViews::LAYOUT, mpListOfLayouts, CQBaseDataModel::notifyGUI(), and pdelete. Definition at line 24 of file CQLayoutsDM.cpp. References mpListOfLayouts, and CCopasiVector< T >::size(). Referenced by clear(), data(), CQLayoutsWidget::deleteSelectedLayouts(), setData(), CQLayoutsWidget::showButtons(), and CQLayoutsWidget::slotDoubleClicked(). Definition at line 124 of file CQLayoutsDM.cpp. References COL_NAME, COL_ROW_NUMBER, COL_SHOW, mpListOfLayouts, and rowCount(). Definition at line 255 of file CQLayoutsDM.cpp. Definition at line 54 of file CQLayoutsDM.h. Referenced by data(), insertRows(), removeRows(), rowCount(), setData(), and setListOfLayouts().